Child of this Culture fosters a positive image of the Hip Hop culture to diverse audiences through arts, sport, cultural education, research, and positive connections. We believe any exposure to arts and culture awakens a person’s intuitive creativity. We also think self-expression in any form when properly nurtured breaks down barriers and equips people of all ages with the ability and freedom to tap into their highest potential. This freedom also allows a person an opportunity to manifest unforeseen growth in themselves and their community. Keyla Escribano, also known as a "B-Girl", started to breakdance at the age of 13. Looking for something "new'' and "challenging", a friend took her to Vinyasa flow class. She was forever changed by it. Keyla enjoyed the transformation yoga sparked in her and she decided to deepen her practice. She started to teach in 2013 after attending Tymi Howard's teacher training. Keyla practices the 8 limb path, Hatha yoga being the foundation to her physical practice and her spiritual path includes study of indigenous cultures, holistic living and alternative healing practices. Keyla teaches yoga, and is a holistic health coach that teaches her students how to eat whole foods, and use foods as medicine to bring about optimum health. As a teacher, Keyla has a free-spirited approach due to her background in a free-form style of dance, none of her classes are ever the same. She believes that life can never be planned; one must learn to give up control and go with the flow. Her classes reflect just that. A yogic practice that expresses love, surrender, healing, playfulness and most importantly gratitude. 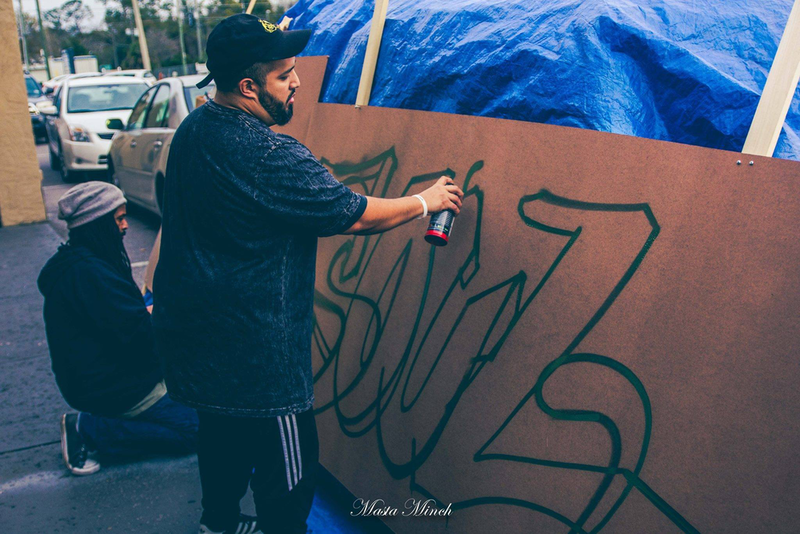 Nathaniel "2NES UNOe" Rios (pronounced Toons) is a South Florida native that now resides in Orlando, Florida. Coming from a house hold with a strong background in the arts it is no surprise he is who he is today. He began drawing at a young age and continued to peruse and practice his talents to some day be able to live off of them. His Style is heavily inspired from cartoons from past to present, he focuses on traditional to digital illustrations, as well as Murals. Still young in the art world 2NES continues to reach his goals step by step and hopes to soon master his style and inspire others. My name is Jade Allen and I was born in Milwaukee, WI. At a very young age I knew what I wanted in life and that was everything. Not the most realistic goal for a child to have, but I wanted it. I aspired to sing, dance, write, draw, film, act and create anything I could. A portion of my childhood was spent in Tuscaloosa, AL. It was in Alabama that I learned much about growing my own plants and the responsibility of a garden. Although I did not grow older to become a gardener of any kind, I found this to be a very important part of my life because it taught me patience. After Alabama I spent the rest of my youth in Milwaukee, WI. Milwaukee is where I hit the ground running and really went after the goals I set for myself. By age 12 I became a Video Journalist for a Time Warner Kids Show called “Kidz Biz”, as well as recorded a series of commercials for the local radio station 88.9 WYMX. In school, I was the news anchor on the building wide show we called JAMS TV and at night I volunteered at Central Office as part of the camera and sound crew to live broadcast the local school board meetings. With that experience, I was able to work as a sound engineer for many of the concert stages set up at the festivals that passed through town. By the time I was in high school, I got involved with college prep summer courses at UW-Madison and played on a softball and basketball team. It was the year 2005 in Madison that I was introduced to the culture of breakdancing and I have never seen anything like it before. Learning to be a b-girl did not come easy to me and that is why to this day I still breakdance. I went on to attend the University of Wisconsin-Madison for biochemistry but there was something about dancing that I wasn’t done pursuing. At this time in my life, my goal of wanting everything narrowed down to just dance. I wanted to dance and it wasn’t until 2010 that I got my first job as a dancer, as the only female breakdancer for the Milwaukee Buck’s “Super Force Squad” and the Chicago Bull’s “Break-a-bulls”. In 2011 I won my very first dance competition and in 2012 was among the 16 selected females to compete at Seattle’s Queen’s Top 16 Invite only Bgirl Battle. That same year I went on to start The Lab Ladies, an online support group for bgirls, with my partner and fellow bgirl, Khay. Dancing can be a difficult career path to support yourself financially on, so the girl behind the breaking was a restaurant manager. I spent a lot of my time working as a manager because it allowed me to travel for dance. 2014 Would be the year that I’d say I struck gold. I found out I would have to relocate with my husband to Fayetteville, NC once he returned from deployment. Initially I wasn’t the happiest person about the relocation, but then I met Cindy, the CEO of Child of this Culture. I was added to the team as General Manager and as a breakdancing instructor for the Bbaby and Young Breakers program that they had started on Fort Bragg and also at various locations off base. Since then, I have been able to dedicate more of my life towards dance. Practicing dance, teaching it and sharing my experiences has been the ultimate accomplishment in my life thus far, in my eyes. Song Kimpton is formally known as Bboy One2 because the foundation of universal human language consists of numbers such as 1, 2, 3…. Song tries to teach the elements of foundation that is needed to preserve the true essence of Hip-Hop culture. Song has been bboying since 13 years old and continues to spread the love of his first passion to the younger generation around the world. Song has traveled all around the world learning different histories, styles, choreographies, forms, and other various skills to use as a tool for teaching dance. Song is what we call a well-rounded dancer who does everything! After graduating from college, Song continues to impact the lives of his community by counseling broken home families and reuniting children who were removed away from their parents from the state. Song is also the Founder of Break Through Hip-Hop, which is a Christian Hip-Hop ministry that tries to “break through” the negative image that Hip-Hop culture has accumulated throughout the social media and over the generation. Song not only teaches dance but volunteers in the housing authority community centers as a mentor. With Break Through Hip-Hop, Song and this team host three to five jams a year creating an opportunity for dancers to unite and be motivated to continue their growth within the community. Song is proud and excited to be the Program Director for COTC of Oklahoma and to work with the children in Tinker Air Force Base and in the OKC metro area. Peace, Love, Unity, and Having Fun. and became the third male dancer to make it on the college dance team out of 5. Kelvin has also danced at high school dances, talent shows, battled in clubs, and danced for local radio station events. This will be Mr. Kelvin’s second year instructing at Fort Bragg. Kelvin was surrounded by music and dance at an early age, and started to dance at the age of three. He continued to learn different styles of dance, but it wasn’t until the movie “Breakin’ Electric Boogaloo”that he developed a passion for popping. It became a quest to study popping and use the style through most of his life. He gained a love for dancing and FINDS happiness when he shares it with others. "It was all a dream!" Reggie "Premier" Brown is a multifaceted Hip Hop Cultural Ambassador. A B Boy, Dancer,Teacher, Choreographer, and Music Producer. He has developed himself into a well rounded Arts professional in every since of the word. Original member of Just Rock Crew est.1999 in Fayetteville, NC and co founder of Fayettevillians: A hip hop/street style dance community conglomerate. He is a 4X National Champion in Hip Hop, a National Step Champion, 5X Beat Battle Champion, and 10X Best Hip Hop Choreography Award recipient. He believes that a child can learn more about themselves and what they are capable of more through hip hop then any other sub culture. "Learning Breakin, Djing , MCing, and Graffiti can unleash the true artist inside a child, making the world there canvas!" When Reggie isn't teaching or training students he is skating, working on movies, tours, and videos. He is a featured character in "United Skates" a Documentary about an underground rollerskating subculture fight for survival and the roller rinks that gave birth to some of the greatest Hip Hop artist of all time! Lito, 34 years old & founder of Soul Rockerz Hip Hop Crew, Director of Soul Movement Ministries & Owner of Soul Culture clothing line. A passion to teach the beautiful & empowering elements of Hip Hop culture while nurturing individuality & faith to be a world changer right from home.